State Route 161 (SR 161) is an east–west state highway in central Ohio. Its western terminus is in Mutual at State Route 29 and its eastern terminus is near Alexandria at State Route 37. It is 57.46 miles (92.47 km) long. 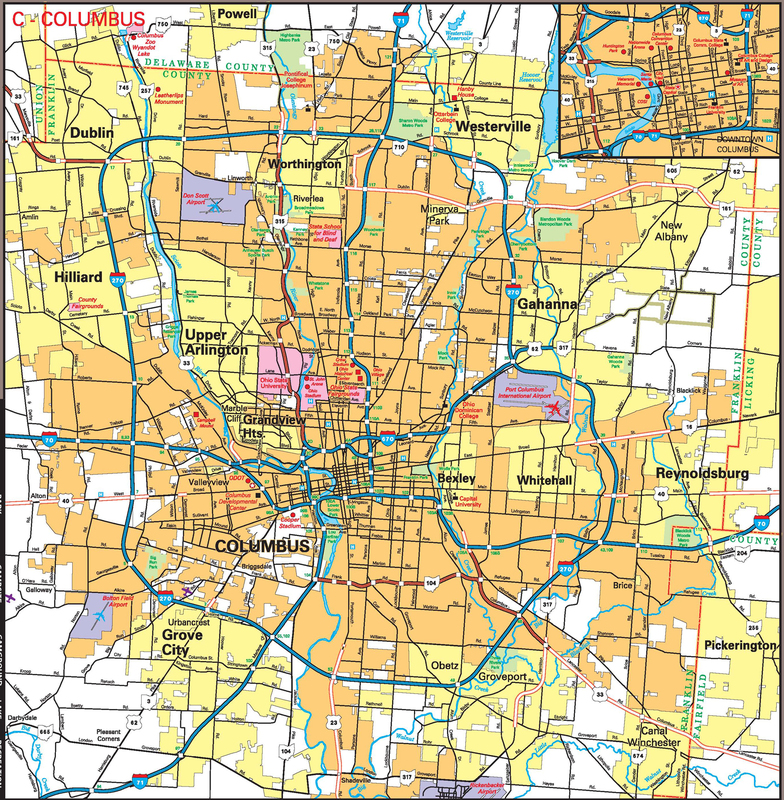 State Route 161 passes through Columbus, Ohio's capital, and a variety of towns including Plain City, Dublin, and New Albany. The route was established in 1924 to connect Plain City and Dublin. It was later expanded to cover Mutual and Granville. Parts of SR 161 in Dublin and New Albany were upgraded to a freeway in 1969 and 1997. SR 161 starts off in Mutual as Milford Road, at a T-intersection at SR 29. The road turns northeast and later meets SR 559 and Bullard Rutan Road in a 5-point intersection. Two miles later, a concurrency begins with SR 4. One mile later, the concurrency ends with SR 4 continuing to move north. About five miles later, SR 38 starts a very short concurrency at Chuckery. After Chuckery, SR 38 splits off. There would be no more major intersections until SR 161 has reached Plain City, as it meets U.S. Route 42 (US 42). SR 161 goes through Madison and a small section of Franklin County without major intersections. In Union County, it meets US 33 and Post Road in an interchange. SR 161 goes on the freeway and starts a concurrency. The concurrency goes back to Franklin County and into Dublin. In Dublin, the freeway has interchanges with Avery–Muirfield Drive and Interstate 270 (I-270). The freeway becomes an at-grade highway as it meets Post Road again. The road goes into Dublin downtown and has intersections with SR 745 and SR 257. At SR 257, US 33 splits off and the concurrency ends. After that, there are no more major intersections until SR 161 reaches Worthington, as it meets SR 315 in a diamond interchange, and US 23 at an at-grade intersection. After the intersection at US 23, SR 161 enters Columbus. There is an intersection with SR 710 and an interchange with I-71. Three miles later, in Minerva Park, SR 161 becomes a limited access freeway. The first exit is SR 3, a partial cloverleaf interchange with service roads. A mile later, SR 161 re-enters Columbus and meets I-270 again in a modified cloverleaf interchange. There is a SPUI-parclo hybrid interchange at Sunbury Road, and an incomplete interchange for Little Turtle Way, a half of a diamond interchange. The next two interchanges, Hamilton Road and New Albany Road, uses diamond interchanges. SR 161 enters New Albany, and has two interchanges with US 62, in Franklin County, and Beech Road, in Licking County. Then it exits New Albany and enters St. Albans Township. In the township, SR 161 has two diamond interchanges with SR 310 and SR 37. SR 161 ends at SR 37. SR 161 is part of the Big Darby Plains scenic byway. The parts of the route that are included in the byway are from Homer Road to Rosedale Road and from Kramer Road to US 33. SR 161 was designated in 1924, as a connection from Plain City to Dublin. Its east end was a junction with SR 21, five miles (8.0 km) west of Dublin. It was later expanded to include an unnumbered section between Mutual and Plain City, and Dublin and Granville. In 1938, a concurrency from five miles (8.0 km) west of Dublin to the city itself was changed from SR 31 to US 33. Much later, in 1969, the five-mile section in Dublin was upgrade to a freeway. Seven years later, the section between I-71 and Sunbury Road was upgraded to a divided highway. In 1997, a bypass was created around New Albany, from I-270 to a point two miles (3.2 km) east of it. SR 161's route was changed to use the bypass, no longer intersecting New Albany's downtown area. The project completed in 2000. On June 14, 2004, Ohio Department of Transportation began the Northeast Expressway Transformation, replacing 17 bridges, 18 ramps, and 5 miles of highway. The project finished in 2008. The freeway in New Albany was extended to SR 37, SR 161's eastern terminus. Currently, new interchanges and solutions are being designed for interchanges of I-270 and Avery-Muirfield Drive. Study started for the interchanges in 2011, and phase one of the project will start in 2014. SR 745 north (High Street) Southern terminus of SR 745; center of "Olde Dublin"
CR 7004 / CR 7005 to SR 3 (Westerville Road) Access via folded diamond interchange and service roads. An unsigned state route named SR 161J exists in Licking County. The actual name of the road is Jersey Mills Road. It starts as a dead end and ends at Jug Street Road. It intersects SR 310, but never meets SR 161. The route suffix "J" means "awaiting abandonment." ^ a b 1924 Map of Ohio (MrSID). Cartography by ODOH. Ohio Department of Highways. August 1924. Retrieved June 4, 2013. ^ a b Staff. "Big Darby Plains". Ohio Department of Transportation. Retrieved June 4, 2013. ^ a b Staff. "Technical Service DESTAPE". Ohio Department of Transportation. Retrieved December 13, 2013. ^ a b Staff. "Ohio State Route 161: Champaign County" (PDF). Straight Line Diagrams. Ohio Department of Transportation. Retrieved June 6, 2013. ^ Google (June 6, 2013). "40.101136, -83.543141" (Map). Google Maps. Google. Retrieved June 6, 2013. ^ a b c Staff. "Ohio State Route 161: Union County" (PDF). Straight Line Diagrams. Ohio Department of Transportation. Retrieved June 6, 2013. ^ Staff. "Ohio State Route 161: Madison County" (PDF). Straight Line Diagrams. Ohio Department of Transportation. Retrieved June 6, 2013. ^ a b c d e f g h Staff. "Ohio State Route 161: Franklin County" (PDF). Straight Line Diagrams. Ohio Department of Transportation. Retrieved June 6, 2013. ^ a b c d e Official Transportation Map (Map). Cartography by Office of Technical Services, GIS Mapping Section. Ohio Department of Transportation. July 2011. Columbus inset. Retrieved June 7, 2013. ^ Google (June 6, 2013). "161/270 Modified diamond interchange" (Map). Google Maps. Google. Retrieved June 6, 2013. ^ a b Staff. "Ohio State Route 161: Licking County" (PDF). Straight Line Diagrams. Ohio Department of Transportation. Retrieved June 6, 2013. ^ 1931 Map of Ohio (MrSID). Cartography by ODOH. Ohio Department of Highways. 1931. § E-10 to I-10. Retrieved June 4, 2013. ^ 1938 Map of Ohio (MrSID). Cartography by ODOH. Ohio Department of Highways. 1938. § G-10. Retrieved June 4, 2013. ^ 1969 Map of Ohio (MrSID). Cartography by ODOH. Ohio Department of Highways. 1969. § G-10. Retrieved June 4, 2013. ^ 1976 Map of Ohio (MrSID). Cartography by ODOT. Ohio Department of Transportation. 1976. § H-10. Archived from the original on October 12, 2013. Retrieved June 4, 2013. ^ 2001 Map of Ohio (MrSID). Cartography by ODOT. Ohio Department of Transportation. 2001. § I-8. Retrieved June 4, 2013. ^ Staff. "NExT Official Project Site". Ohio Department of Transportation. Archived from the original on June 17, 2007. Retrieved June 5, 2013. ^ ODOT District 6 Communications Office (July 14, 2008). "Major Work Now Complete on Largest Central Ohio Construction Project" (Press release). Retrieved June 6, 2013. ^ Staff. "Licking County State Route 37/161". Ohio Department of Transportation. Retrieved June 6, 2013. ^ Staff. "I-270/US 33 Interchange Solution". City of Dublin. Retrieved June 6, 2013. ^ Noblit, Jennifer (March 2, 2011). "Dublin to start studies with ODOT". Dublin Villager. Retrieved June 9, 2013. ^ Rouan, Rick (May 16, 2013). "I-270/Rt. 33 plan seeks crash relief". The Columbus Dispatch. Retrieved June 9, 2013. ^ a b Staff. "Ohio State Route 161J" (PDF). Straight Line Diagrams. Ohio Department of Transportation. Retrieved June 2, 2013. ^ Staff. "Straight Line Diagram legend" (PDF). Ohio Department of Transportation. Retrieved June 10, 2013.